Our latest therapy for Rodney is moxibustion, a traditional Chinese medical practice of burning dried mugwort. I had moxa sticks around the house, having tried it with Previous Horse and Mathilda. Neither they nor I was impressed. However, Internet surfing informed my medical advisor that moxa can be used on scar tissue. He dug up an old stick. Rodney LOVED it. Does it work? Who knows. I’ve been doing energy balancing and massage with horses for years and am still undecided on the effectiveness. Clearly the horses enjoy it. I’ve seen licking, chewing, yawning, eyerolling, deep sighs, farting, horse mego, even a sharp kick with two different horses from bilateral balancing across the hips. When I was working on the earth meridians for one of the Saddlebreds (Sam), the horse pitched a fit. He made it clear that I had started on the wrong side. I switched. He calmed down. I have a witness. Does it have an effect past the short-term gain of relaxation? I like to think so. If nothing else, it fulfills the first principle of medical ethics: Do No Harm. Plus, doing something nice for a horse has its own benefit. The moxa sure smells nice. I have found that I get more distinct response from Rodney if the moxa stick is a blowin’ and a goin’. In a 45 minute session, I need to re-rev 2-3 times. 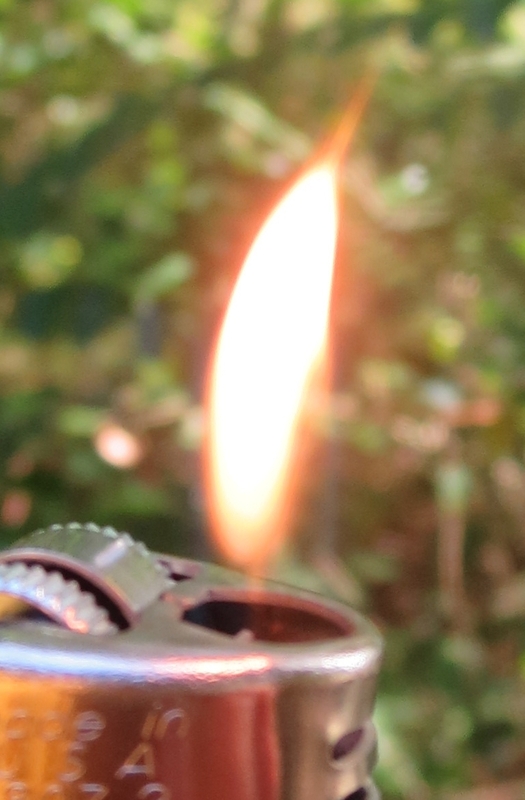 A lighter is the easiest way to do this. Can we pause to ponder that? One of the defining characteristic of Homo sapiens, the ability to make fire, in my hand for the price of a candy bar. Tell me this isn’t a modern miracle.